At Castle Hill Fitness, we are proud to offer Austin’s finest yoga instruction in a supportive, encouraging, and relaxing environment. Our center encompasses four beautifully appointed studios across two locations, fully equipped with an array of yoga props and mats, highly qualified instructors, and accommodates any level of practitioner. 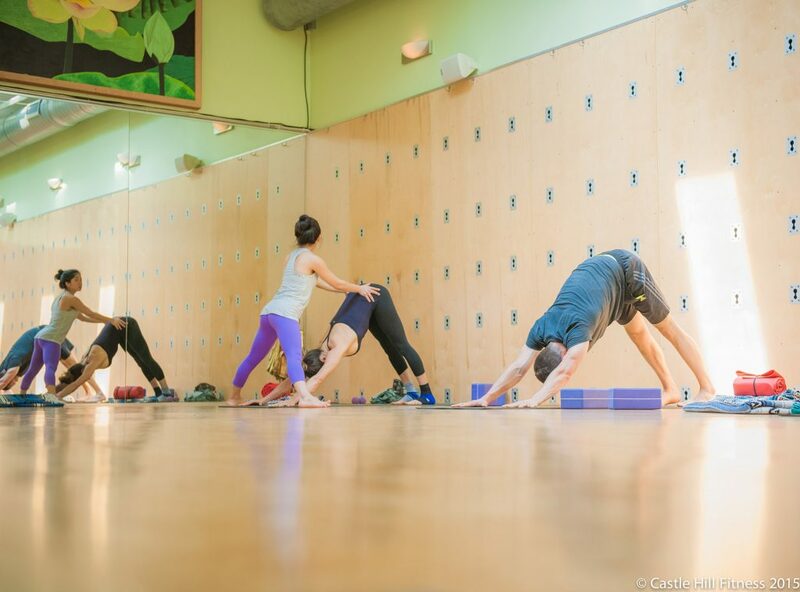 Our class schedule features over 40 yoga classes a week, in a wide variety of styles. SamAdhi (liberation): merging consciousness with the object of meditation. What Kind of Yoga Classes Does Castle Hill Fitness Offer? The classes we offer can be broken down into three different types: Flow Classes, Form Classes, or Relaxation Classes. Yoga flow classes provide a unique cardiovascular element to your yoga practice. As you synchronize your breath to the movements in class you will begin to feel the immediate benefits like increased blood circulation, improved flexibility, and reduced stress. Most yoga classes are set to music, but not always. There are other types of yoga that focus more on the shape and form of the individual postures. Build stamina and strength in our flow yoga classes that hold postures for longer periods of time. Classes may include the use of props to support the body as it progresses to more challenging movements. While any yoga class will result in overall relaxation, there are some types that provide an even greater calm. Movement is limited in these yoga classes and is often passive, done on the floor, or surrounded with a number of props. Surrender to gravity and experience a deep state of recovery. Vinyasa classes are usually much more fluid and fast-paced, with a focus on synchronizing your breath with each movement. Vinyasa allows for a wide variety of postures which means flows will often vary from class to class, and from instructor to instructor. This differs from styles such as Ashtanga Yoga, which repeats the same sequence in the same order every time. Rather than holding poses for an extended period of time, attention is geared towards a smooth transition in between postures. This movement-based style generates heat and therefore offers a more cardiovascular element to your practice. The meaning of Yoga refers specifically to the intense and prolonged effort that characterizes a dedicated yoga practice, and generally refers to all styles of yoga that practice physical postures. Hatha Yoga is a particular system of yoga described by Yogi Swatmarama in its manual Hatha Yoga Pradipika, dated from the 15th century. The system of Hatha Yoga focuses on the purification of the physical body as leading to the purification of the mind and of the vital energy, or prana. The publication of the Hatha Yoga Pradipika marked the development of asanas into the full body postures and its many variations now in popular usage and of the particular style that many people associate with the word yoga today. You can expect classes titled as ‘Hatha Yoga’ to be gentle, slow classes that delve into the basics of yoga postures. 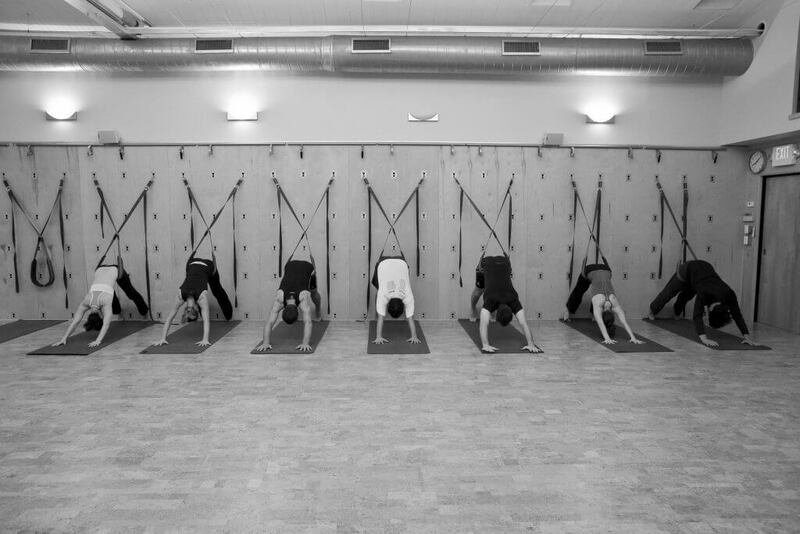 Some of our Iyengar classes use the Yoga Wall to ensure proper alignment. for a long time in order to properly focus on the form of each one. Props are commonly used in classes, to aid in performing the asanas accurately and effectively. This precise yoga methodology builds strength, stamina, balance, and mobility. Anusara Yoga is a system of Hatha Yoga that encapsulates a life affirming Tantric philosophy, focusing on alignment in a heart-oriented practice. The core philosophy of this practice of yoga is deeply spiritual, grounded in the belief of the intrinsic goodness in all of us. Anusara is centered on the five Universal Principles of Alignment, a set of biomechanical principles that inform all postures. Ashtanga is a system of yoga that was taught by the late Sri. K. Pattabhi Jois at his Institute in Mysore, India. It consists of sun salutations followed by a specific sequence of poses that are to always be repeated in the same order. Students develop and perfect each level of Ashtanga before moving on to incorporate the next sequences into their practice. Ashtanga Yoga links breath with movement, thereby creating a deep internal heat that is meant to purify the body. Mysore-style is the traditional method of teaching Ashtanga yoga – it engages students in a self-paced, individualized practice in a group setting, with hands-on assistance from the instructor when needed. Read our interview with the instructor of our long-running Ashtanga Yoga program, Juan Anguiano, to learn more about what you can expect when you attend. Receive support and alignment with hands-on assists in Forrest Yoga. emotional and physical healing by encouraging your authentic self. Prajna Yoga combines therapeutic somatic movements, dynamic asana, and meditation to cultivate a deeper body-mind connection. The aim of this practice is to hone an intuitive wisdom, by applying the principles of Buddhist teachings and Hatha yoga techniques. Through a focus on form and alignment and meditative practices, a greater understanding of self can be achieved. Restorative yoga is all about establishing a full body relaxation through long, gentle sequences and deep breath work that aids in soothing the nervous system. Props are typically used, to encourage your body to rest and unwind. These classes offer spaces for you to detach from the hustle and bustle of every day life and reconnect with your spirit, mind, and body in a safe and nurturing space. In deciding which type of yoga to practice, you need to take several things into account: your likes, your dislikes, your personality, your schedule, your level of stress, your overall physical condition, and what you hope to achieve with your practice. If you are brand new to yoga, you will want to start with beginner classes to learn fundamental poses and alignment principles and to avoid injuries. Finding a class and an instructor that best fits your wellness goals is key and one of our top priorities, so please feel free to use your free 3-day trial to try our weekly beginner classes, meet different instructors, and get exposed to various styles of teaching. By reading the class descriptions on our website, you will gain further insight into the various yoga traditions we teach and practice here at Castle Hill Fitness. Our teaching faculty at Castle Hill is as varied as the different classes on the schedule – no two teaching styles are the same, and each instructor offers a different unique experience. Yoga classes are available a la carte, which means you do not have to be a member to attend, or enjoy free classes every month with a membership (VIP receives unlimited monthly classes). Whatever your skill level, goals, and preferred style are, our well-rounded yoga program has what you need!